Insulating glass is composed of two sheets of float glass. Between the two sheets of glass is an aluminum spacer filled with desiccant. 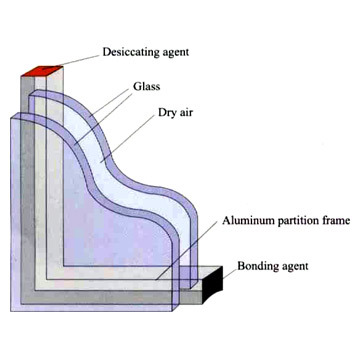 The aluminum spacer and sheets of glass are adhered and sealed by butyl and then polysultide or silicon. Various effects can be achieved through different combinations such as with coated glass, tempered glass or laminated glass. Insulating glass is widely used on upscale building, office buildings, airports and refrigerator. Advantages︰ Insulating glass is a kind of glass with high efficiency insulation to sound and heat, the heat transmission coefficient of insulation glass is 1.5~3.48 w/m2.k. It can reduce noise by 30 db according to measurement. Dew point of insulation glass will reach -50℃, -15℃ lower than normal glass windows.